Sells books, Bible studies, rosaries, art, and seasonal gift items. Wide selection of Catholic books, medals, statues, tapes, rosaries, baptismal gifts. Online ordering, by mail or telephone. Wide selection of Catholic books, medals, statues, tapes, rosaries, baptismal gifts. Online ordering, by mail, fax, or telephone. Association of retailers and suppliers of Catholic literature, music, gifts, and other products and services consistent with the teachings of the Catholic Church. Selection of books to appeal to the traditional Catholic, rosaries, crucifixes, videos, gifts. Online ordering. Online Catholic store. Site has its own search engine to find items quickly. Online ordering. Catholic Family Videos, Gifts and Services. Statues, medals, holy cards, plaques, and other Catholic merchandise. Church supplies, Catholic books, and gifts. Order online, or call toll-free in the U.S. Selling Orthodox and Byzantine Catholic Books, Icons and Gifts. Extensive selection of items. Christian gifts, books, music, school uniforms, church supplies and furnishings. Online shopping and catalog orders. Catholic store offering books, Bibles, cards, gifts, music, videos, icons, and many other religious goods, including church supplies. Testimony of Jesus Christs saving grace and the Holy Spirits free gifts of power by former Catholic. Catholic goods, books, religious articles, candles, vestments, and religious gifts. Catholic books and religious goods. Sells rosaries and chaplets, statues, prayer cards, crucifixes, stained glass, childrens gifts, wide selection of medals. Source in St. Louis for Christian gifts, books, music, school uniforms, church supplies and furnishings. Online shopping and catalog orders. Retailer of Catholic spiritual gifts, including the sacraments of baptism, first communion, confirmation and marriage. A guide to buying appropriate gifts for relationships at various stages. Online sales of Islamic gifts, art, clothing, and halal food products. Bible bookstore, gifts, CDs/cassettes, other religious goods, located in Fairbury, IL. Rosaries, scapulars, medals, statues, creches, gifts, religious art. Online ordering. Fraternal gifts and promotional products. Greeting cards, gifts and clothing. Provides Catholic goods, books, religious articles, candles, vestments, and religious gifts. Includes catalog and directions to store in Wheaton, Maryland. Hanukkah gifts, jewelry, and Judaica. Messianic books, music, art and gifts. Metaphysical gifts including books, incense, t-shirts, tarot cards, runes, candles, and sarongs. Sells gifts and collectibles, many suitable for engraving. Medals, rosaries and rosary bracelets, crosses, jewelry, statues, books to appeal to the traditional Catholic. Shopping online, by phone, fax, or mail. If the business hours of The Catholic Company in may vary on holidays like Valentine’s Day, Washington’s Birthday, St. Patrick’s Day, Easter, Easter eve and Mother’s day. We display standard opening hours and price ranges in our profile site. We recommend to check out catholiccompany.com/ for further information. 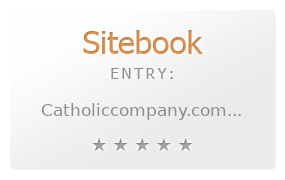 You can also search for Alternatives for catholiccompany.com/ on our Review Site Sitebook.org All trademarks are the property of their respective owners. If we should delete this entry, please send us a short E-Mail.